Currently studying Percussion at the Don Wright Faculty of Music at Western University, where I am in the Percussion Ensemble and Symphonic band. In the past, I have been in both concert bands, jazz bands and even some choirs. I began playing drum kit when I was about 1o and fell in love with it. As time passed, I grew to experiment with different genres (jazz, latin grooves, funk, etc.) and also enjoyed orchestral percussion as well. 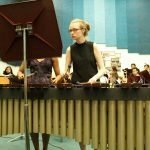 In my final year of high school, I was music council president and received the OBA Concert Band Festival Music Leadership Award (2017) and the MusicFest Nationals Honour Award (2017) for my leadership efforts, as well as the WorldStrides Maestro Award (2017) for my drum kit solo at a competition in Montreal. No matter what your previous experience with music is, I am open to all students from a variety of backgrounds who are simply curious and eager to learn!